When evidence is slender, it’s tempting to make too much of what little there is. Edward McCaul, the man who married Thomas Lovewell’s eldest daughter Julia in 1871, provides a good example. Edward was running a restaurant and billiards parlor in Carbondale, Kansas, in 1880. A few years later he put a house up for sale and left Carbondale. We know that in 1883 a man known as Edward McCall opened a billiards parlor in St. Louis, the city where Julia’s husband would be fatally injured while working on a depot roof in 1893. The difference in spelling is insignificant. Even the Carbondale paper always printed the surname of the familiar figure on Main Street as “McCall.” Were the two billiards entrepreneurs the same man? I would put some money on the affirmative position, but not a large sum. Recently I suggested that Mary Lovewell’s jaunt to Dodge City in January 1895, where she declared her intention to live permanently with her sister Adaline, may have been related to Adaline’s worsening medical condition. The problem is that we’re not even cetain Adaline had a medical condition in 1895. She certainly died of something in 1903 at the age of 30, but my conclusion that the culprit was consumption is validated by nothing more than a rumor among her descendants. I honestly would have put money on the connection between Mary’s visit to Dodge and her sister’s health, but only my loose change. Judging from an item printed in the Courtland Register on Februrary 22, 1895, I would have lost even that small bet. We are glad to note that Miss Mary Lovewell did not like Dodge City, and has returned home. I had also toyed with the idea that Thomas and Orel Jane sent the girl to spy on the health of her older sister’s marriage - but only after learning that Adaline’s husband flew the coop that October, hiding out for a few weeks in that den of sin, Kansas City, where he enjoyed a brief spree on someone else’s dime before being tracked down and brought home. However, it turns out that Mary Lovewell’s road trip was probably a case of a 14-year-old girl’s wanderlust, and nothing more. Sure, we’re welcome to read something sinister into it, but there’s no evidence that it was anything more than a whim that didn’t pan out. Despite the cosmopolitan advantages of Dodge City, Mary got bored with the former cowtown, returned to Lovewell, and married Ben Stofer a year later. 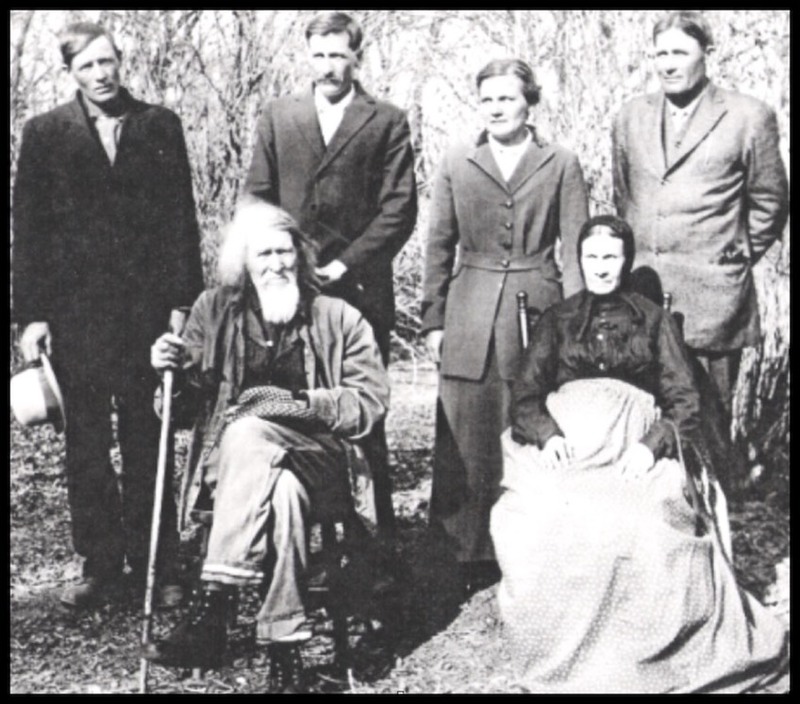 A few years ago, Dave Lovewell and I took pride in working out the exact date when a pair of family pictures were taken, group portraits showing Thomas and Orel Jane seated among descendants and well-wishers. What I probably should have said is, we had fun looking for clues. Although the photo caption in “The Lovewell Family”says the group posed for a photographer in May 1914, judging from the look of foliage in the background, the apparent age of a little girl in the arms of Grant Lovewell, and the identification of a spheroid object in the left hand of Ben Stofer, Dave and I suggested that clues point to a likely date of December 20, 1913, Thomas Lovewell’s 88th birthday. We were so sure. All right - I was so sure, and Dave went along with me. Among the deluge of news clippings that have recently become available online, there is one about a photographer calling himself “Wray the Face-Maker” who was enroute from Courtland to record images of the Lovewells’ golden wedding anniversary on April 1, 1916. Taking a fresh look at the photos in question, I had to confess that the elderly couple at the center of the group easily could be co-celebrants, and that the landscape looks about right for the first day of April. I held off making another round of adjustments to old blog postings, while going over all the evidence one last time. Just because Millard Homer Wray headed for Lovewell with his camera in the spring of 1916, doesn’t mean that he hadn’t been there before, taking pictures of previous celebrations. Wray had lived at Courtland for decades, and must have been a frequent visitor at Lovewell, where his brother Everst lived. Putting aside what seems to be an apple in Ben Stofer’s clutches, there’s also the matter of little Freida Lovewell, William Frank Lovewell’s toddler, who was identified as the child hoisted by her uncle, standing in the back row of the large family gathering. Unfortunately, Freida died at a Nebraska hospital after experiencing typhoid-like symptoms late in the summer of 1914. If it’s really the Lovewells’ 50th anniversary depicted in those photos, then that child can’t be Freida. If it’s Freida in the photo, then it must be Thomas’s 88th birthday, and there’s a set of family photographs of an anniversary party out there somewhere that have never been shared. Nearly two years back when I submitted the blog entry “The Half-Life of Freida Lovewell,” I lamented that, “a vintage newspaper item published about an anniversary party honoring Thomas and Orel Jane Lovewell in 1916 could easily pass for a description of those photos,” concluding that the only solid stumbling block was the presence of that one little girl. Then, Thomas and Orel Jane’s great-great-grandson Phil Thornton sent a Superior Express clipping from 1977 containing the photograph of the elderly couple with their children, identified as having been taken on their golden anniversary March 21, 1915. Not only was this the third date suggested for the picture, it was the third year, and so far none of them had been right. The story about “Wray the Face-Maker” tips the balance. The time of year matches the look of the landscape, the number of celebrants in the photo is exactly right, and we now know that the 50th anniversary party was photographed, and by whom. So, for the record, here is one of the photographs taken by “Wray the Face-Maker” on April 1, 1916, paired with an accurate caption printed in the Salina Evening Journal six days later. Thomas Lovewell and wife, for many years residents of the White Rock country lately celebrated their golden wedding anniversary at their home in Lovewell in the presence of twenty five relatives and friends, including their four children, Frank, Stephen and Grant Lovewell and Mrs. Mary Stolpher, being in attendance. A bountiful dinner was served at noon. Okay, the Evening Journal misspelled Mary Stofer’s name. I said it was accurate. I didn’t say it was perfect.